The 10 Best Summer Activities in Arizona! In a place where it feels like summer year-round, Arizona knows how to have fun in the sun. From trips to the Grand Canyon, to the most immaculate hikes in America, to exciting baseball games, the opportunities in the summer here are abundant. Put on some sunscreen and get ready to enjoy these 10 great summer activities to do in Arizona. Visiting the Grand Canyon is a bucket list item for many people. During the summer, the mile-deep canyon is home to millions of adventurous tourists from near and far. The Grand Canyon offers many unique experiences in addition to its stunning views. There are many camping, hiking, and rafting opportunities for all kinds of visitors. The Grand Canyon is one of the Seven Natural Wonders of the World for a reason, and it’s right in our backyard. What are you waiting for? Mesa isn’t a city that’s known for its water activities. So you may be surprised to learn about Salt River tubing. The Salt River is a 200-mile-long stream that flows through the Valley of the Sun. Salt River Tubing allows locals to take a two to four-hour floating tour of the river from the safety of an inner tube. Tubing is open from May through September and regularly attracts Valley residents looking to cool off in the heat of summer. Oak Creek Canyon is home to the legendary Slide Rock State Park. This 43-acre park derives its name from the giant natural rock water slide. Visitors can enjoy riding an 80-foot chute into a refreshing creek. In addition, Slide Rock is home to gorgeous sandstone formations and stunning scenery. Tourists can enjoy the swimming hole, sunbathing, or exploration during a summer visit. 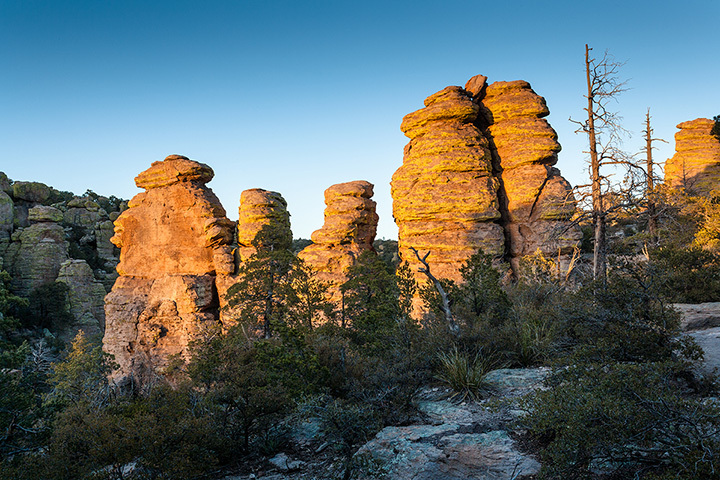 Prescott is one of the best-kept secrets in Arizona. This northern Arizona city is home to cool weather, small town charm, and idyllic hiking trails. Arizonans can enjoy all of the above by going to Watson Lake. This picturesque lake is located just minutes away from downtown Prescott. You can spend a day fishing, boating, hiking, and exploring. Stunning views and local wildlife surrounds the lake. The lake also has several picnic ramadas, barbecue grills, and horseshoe pits perfect for a midday cookout. Phoenix may set heat records during the summer. But at night the weather becomes bearable enough that locals choose to leave their homes. One way to take advantage of the cooler weather is by taking a sunrise hike. Phoenix is home to some of Arizona’s best hiking trails that offer breathtaking views of the city. Camelback’s Echo Canyon Trail a renowned hike that peaks at a 360-degree view of the city. For an easier morning trek, locals can hike Papago Park’s “Hole in the Rock” trail. It’s a mild half-mile trail that has epic sunrise views. Fossil Creek is home of the famous toilet bowl. Don’t let the name fool you. This pool of swirling water actually comes from a decommissioned dam. Fossil Creek is located in the Coconino National Forest. It takes about a four-mile hike to reach the creek. Once there, you can enjoy jumping in and enjoying refreshing swimming holes. The creek offers an isolated and calming reprieve from city life and a great summer activity for exploratory Arizonans. Take a walk on the wild side at Bearizona Wildlife Park. Well, maybe it’s better off to drive. Bearizona is a popular tourist destination hidden in the Kaibab National Forest. It’s home to a variety of wildlife species, including black bears, bison, and Arctic wolves. Visitors can drive through the park and get up close and personal to the animals. Just make sure to roll the windows up. Sedona is a big tourist destination in the summer. Locals and visitors flock to Sedona to experience its beautiful red rock formations and stunning views. One of the best ways to get the full Sedona experience is by hopping on a Pink Jeep Tour. A knowledgeable tour guide will take you through a tour of Sedona’s rich geology and famous landmarks. This fun filled adventure allows you to get up close to some of the most memorable sights in Arizona. Phoenix can often feel like a ghost town in the summer. But that doesn’t mean there isn’t entertainment. The Arizona Diamondbacks season runs through the entirety of the summer. Their air-conditioned ballpark, Chase Field, seats nearly 50,000 fans looking to cheer on their beloved MLB team. Chase Field is one of the more unique ballparks to see a game. They have post game fireworks on the weekends and are pet-friendly during their “dog days of summer” games. In addition, Chase Field has an 8,500-gallon pool that doubles as the best seat in the house. Tombstone is known as the town too tough to die. This western themed town was the city of the infamous gunfight at the O.K. Corral, which featured famous cowboys Wyatt Earp and Doc Holiday. Today, the city maintains the look of its Wild West heyday. Visitors can drink at saloons, explore museums, and even watch a reenactment of the famous gunfight. Tombstone also his milder weather than Tucson and Phoenix, making it a great day trip destination for local Arizonans.